As the last great victory of the American Revolution, the 1781 Siege at Yorktown is known for the use of artillery by General George Washington’s Continental Army. Through interactive elements and artifact displays, the “Blast from the Past: Artillery in the War of Independence” special exhibition features artillery used on all fronts of the American Revolution by the American, French and British forces. From June 10, 2018, through March 3, 2019, the special exhibition explores a range of topics from innovations in artillery design and technology to the individual roles of an artillery crew. Topics examine artillery deployment and transport, as well as the range of fire and science behind these powerful weapons. “Blast from the Past: Artillery in the War of Independence” highlights the chronology of the weapons and reveal the technology and innovation that delivered the last great victory of the Revolution – a victory that forever made Yorktown, Virginia, the place where the subjects of a king became the citizens of a nation. British 12-pounder bronze “Lafayette” cannon, circa 1759, on loan from the National Park Service, Colonial National Historical Park, Yorktown Collection. 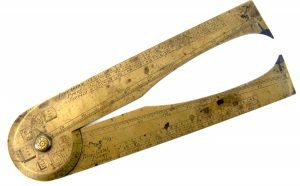 Gunner’s calipers signed by British instrument maker, George Adams, circa 1740. Jamestown-Yorktown Foundation collection. 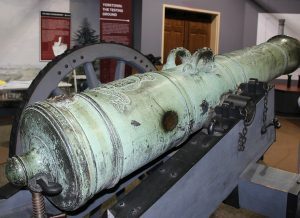 In addition, visitors can see a reproduction of a 24-pounder French siege gun in the permanent exhibition galleries that leads to the “Siege of Yorktown” experiential film, offering visitors a chance to experience the decisive 1781 Revolutionary War battle with wind, smoke and the thunder of cannon fire. The film is shown throughout the day. 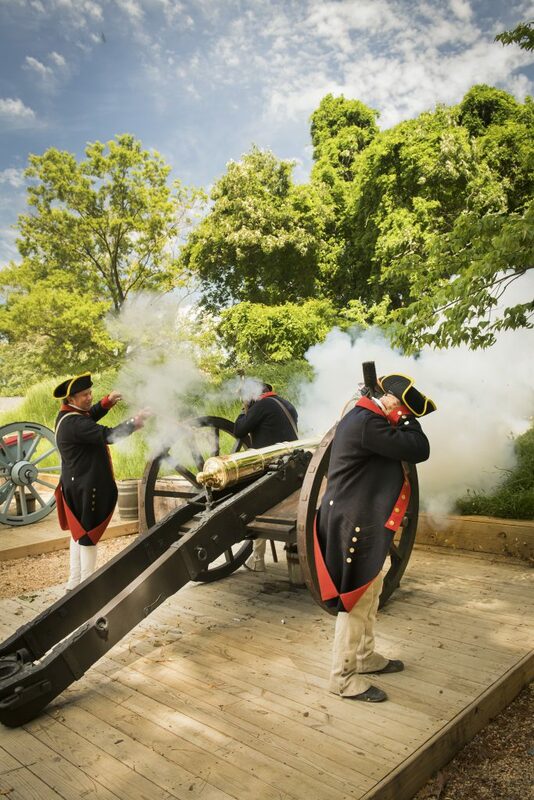 A series of programs, demonstrations and musical performances highlighting the role artillery played during the Siege of Yorktown and the American Revolution accompanied the special exhibition from June through December 2018. The special exhibition opened June 9 and 10 with an “Artillery Through the Ages” weekend, which examined the evolution of artillery and its important role during military engagements. On October 20 and 21, in conjunction with the annual Yorktown Victory Celebration event, visitors enjoyed “A Weekend of Revolutionary Noise” with re-enactor encampments. On October 21, the weekend event concluded with an evening performance of Tchaikovsky’s “1812 Overture,” as well as other compositions, by the College of William and Mary Symphony Orchestra. On November 8, visitors took in an evening public lecture, “From Aprons to Armaments: Women’s Role in Artillery.” At 7 p.m., Ali Kolleda, archivist with the U.S. Army Women’s Museum at Fort Lee, examined the history of women in artillery. The American Revolution Museum at Yorktown tells the story of the nation’s founding, from the twilight of the colonial period to the dawn of the Constitution and beyond. Comprehensive indoor exhibits and outdoor living history capture the transformational nature and epic scale of the Revolution and its relevance today. Open 9 a.m. to 5 p.m. daily (until 6 p.m. June 15-August 15), the American Revolution Museum at Yorktown is located at 200 Water Street, in Yorktown, Virginia. Parking is free. 2019 admission is $15.00 for adults, $7.50 for ages 6 through 12, and free for children under 6. 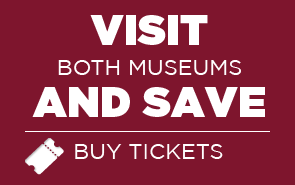 A value-priced combination ticket to the American Revolution Museum at Yorktown and Jamestown Settlement is $26.00 for adults and $12.50 for ages 6-12. Admission for residents of York County, James City County and the City of Williamsburg. to the Jamestown-Yorktown Foundation, Inc.